With undying gratitude to Marko Peljhan, Matthew Rempes, Kathy Hardin, David Fodel, Shawn Greenlee, Mark Cetilia, Victoria Shen, Jonas Bers, Mike Sidnam, Paloma Kop, Bob Bellerue, Sofy Yuditskaya, and Carol Parkinson. My personal and academic research into experimental vector graphics systems culminated in the most significant event of my entire year, the Vector Hack Festival in October 2018. 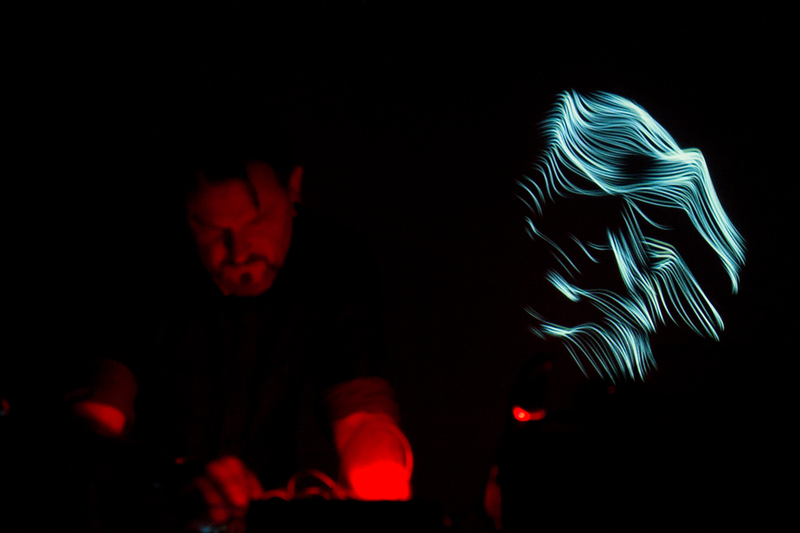 This festival sprung out of discussions Ivan Marušić Klif initiated with me in July 2017, when we both made the first public releases of our Pure Data and Max/MSP code libraries for displaying vector imagery on the oscilloscope using audio signals. Klif and I envisioned the event as a forum where artists creating experimental audio-visual work for oscilloscopes, vector monitors, and laser displays could share ideas, develop their work together, and form an actual community from the disparate artists working in this field, who otherwise only knew each other through the online world. We also curated a public program of open workshops and talks aimed at allowing young artists and a wider audience to learn more both about creating their own vector-based audiovisual works, and about the scientific and artistic history of these techniques from the 1950’s onward, as well as organizing a rich performance program which demonstrated a diverse range of techniques and artistic approaches in action. In total, we gathered a group of twenty-three participants, all working as researchers, teachers, developers, and performers in the field of experimental vector visuals, from across the EU, the USA, and Canada. The program was held between two very different locations in two different cities. 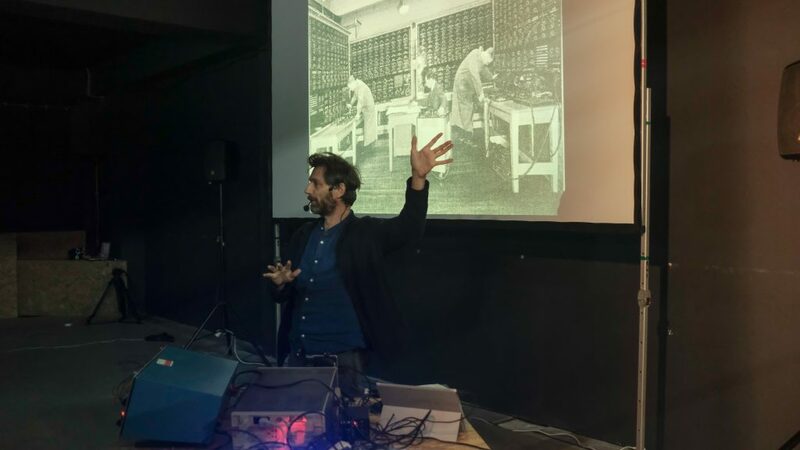 The first half of the festival in Zagreb, with talks and performances oriented towards a larger public audience, was held in a large hall of the Nikola Tesla Technical Museum from the 2nd to 4th of October. We found it especially significant that this museum was also the site of the fifth and final New Tendencies/Nova Tendencije exhibition in 1973, which had focused on “Constructive Visual Research, Computer Visual Research, [and] Conceptual Art”. 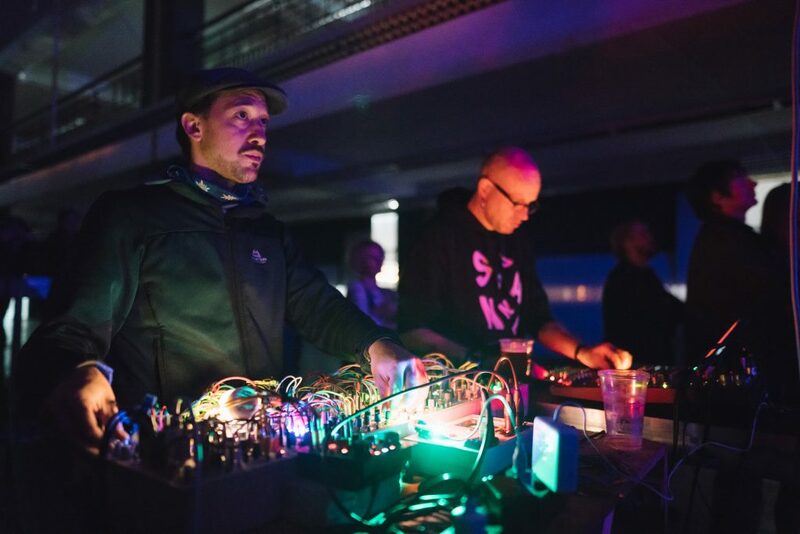 There, the keynote and subsequent presentations were very well attended by audiences of between 30-60 people each evening, while the biggest performance night featuring Robert Henke and Bernhard Rasinger drew approximately 300 people. 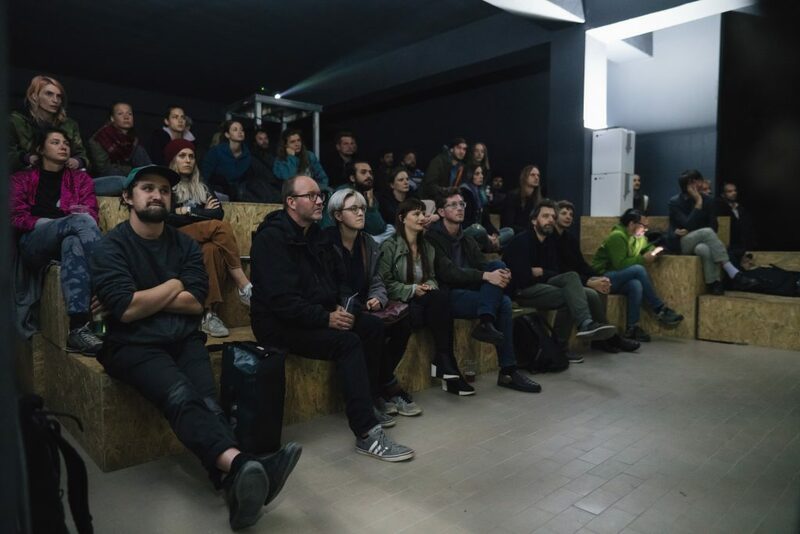 In Ljubljana, the Osmo/za venue was significantly smaller and therefore the program focused more on discussion between the event participants alongside the evening performances from the 5th to the 7th of October. The event was organized locally by Ivan Marušić Klif, the Radiona.org Zagreb Makerspace, the Ljudmila Art and Science Laboratory, and Zavod Projekt Atol. Curatorial duties were shared between myself and Klif, with assistance kindly given by Chris King of the Video Circuits group. One of the highest priorities of the program was given to the sharing of technical know-how with a general audience in both a discursive and a participatory manner. In both cities, Jonas Bers and Philip Baljeu each gave practical electronics workshops focused on building the CHA/V (a “Cheap Hacky Audio/Visual” synthesizer based on the deliberate misuse of a Chinese VGA test pattern generator) and the OGA (“Oscilloscope Graphic Artist”, a circuit developed by technology writer Mitchell Waite and published in Popular Electronics magazine in 1980). Hansi Raber and Jerobeam Fenderson also each gave presentations on different aspects of their OsciStudio software, which may be the most well-known of the ‘oscilloscope music’ platforms, with Raber focusing on the freshly-implemented live coding functions of the application and Fenderson covering its artistic and performative use with a strong nod towards the computer gaming and demo scene. 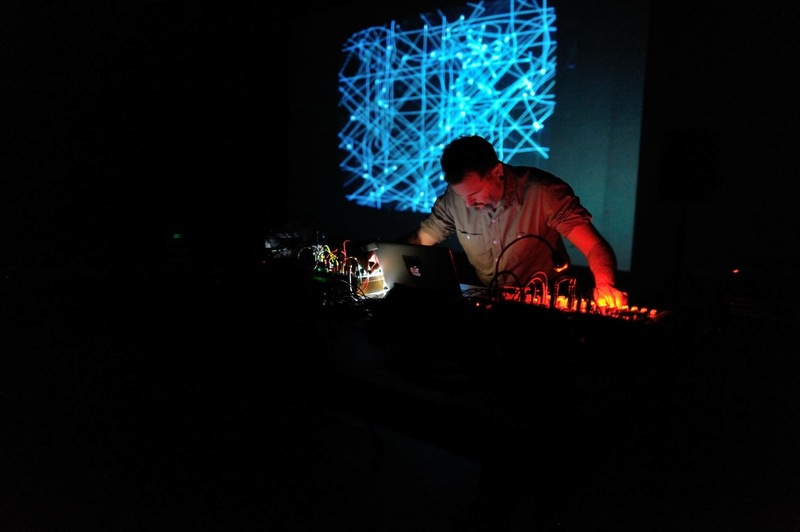 The three other major coding platforms for audiovisual vectors, Pure Data, Max/MSP, and Processing, were demonstrated by my own Vector Synthesis library and Douglas Nunn’s additional Pd research, Ivan Marušić Klif’s REWereHere patch, and Ted Davis’ XYscope library respectively. Equally important hardware approaches were elaborated by Andrew Duff and Bernhard Rasinger’s discussions of analog modular synthesis for the Vectrex and ILDA laser display, Roland Lioni’s (aka “akirasrebirth”) examples using the Axoloti microcontroller DSP board, Joost Rekveld’s self-built analog computers for the generation of vector-based HD video, and Baljeu and Bers’ presentations of their own oscillographic and scan processing systems inspired by the Rutt-Etra video synthesizer from the 1970’s and Mitchell Waite’s circuits from the 1980’s. 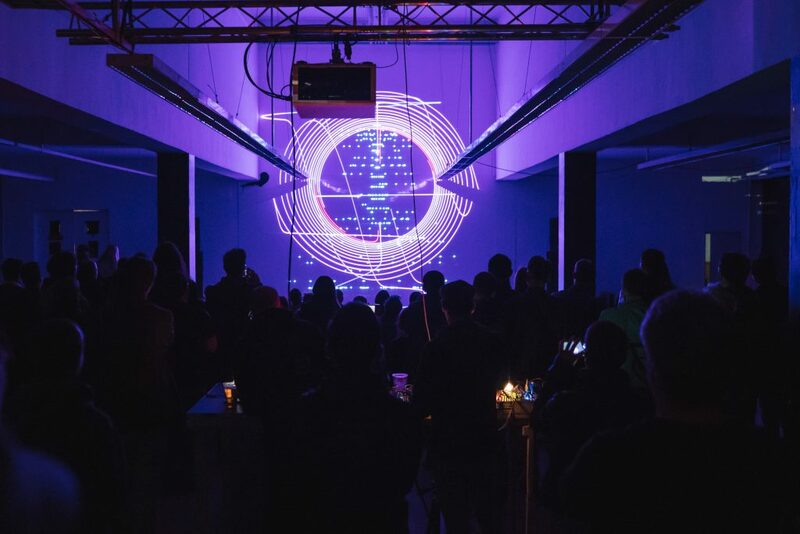 Finally, Robert Henke gave an extensive tour through the progressive iterations of his monumental Lumiere performance, along with details of the laser controlling software and hardware necessary to execute them. The event also strived to provide a historical context for the contemporary activities it showcased, as well as cities in which we had chosen to work. We were very fortunate to welcome artist-researcher Darko Fritz, who provided a survey of vector-related works from the New Tendencies art movement, which was born in Zagreb and saw its most important exhibitions and publications come together there. And in Ljubljana, the artist and curator Ida Hiršenfelder presented a wonderful overview of Slovene computer art during the Yugoslav era, extending from the 1960’s to the 1980’s. Each of these talks was intended to provide a local artistic frame of reference for the visiting foreign participants, however much of the material was also new to many – in particularly the younger generation of – local audience members as well. From there, other keynote presentations dug into various particular technologies and their historical applications both in and outside of the art world. Rekveld set out an impressive display of early mechanical and electronic devices used to create physical analogies of real-world phenomena to provide real-time simulation and interaction for scientific and industrial engineering applications, while I gave a window into my own research on the military development of computers as a means of simulating, predicting, controlling, and eventually annihilating unknown ‘others’, and where the legacy of these origins might be found in contemporary computer graphics. Researcher Stefanie Bräuer focused on a very specific historical setting, namely the use of technologies such as oscilloscopic and stereoscopic imagery in the 1950’s films of Mary Ellen Bute, Hy Hirsh, and Norman McLaren which she described as marking a change in focus from mechanical to electronic means of image production in experimental cinema, while Chris King sought to bring together the developments of mechanical drawing machines with concurrent and subsequent experiments in video synthesis and vector graphics. The majority of participants who gave workshops or talks, as well as laser artist Alberto Novello who could only join us for the last evening, also made performances demonstrating their self-made systems for a public audience. However, for me the most exciting moments lay in the new configurations and collaborations which sprang up during the festival. 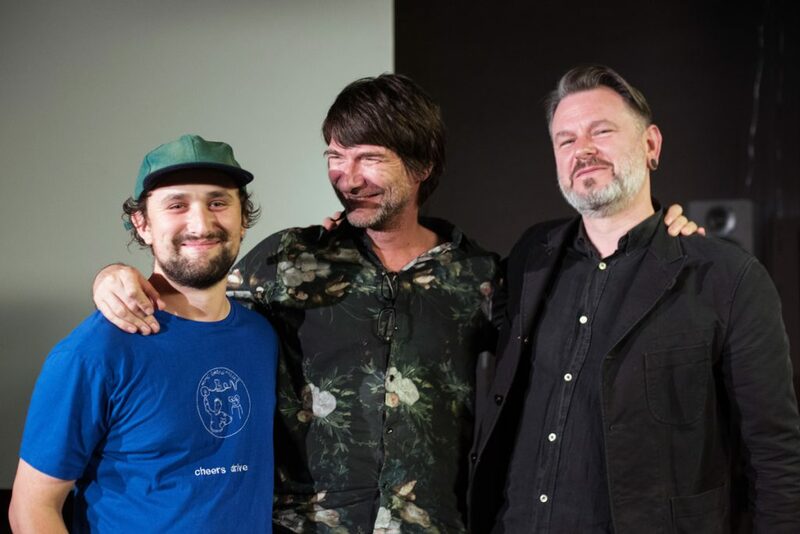 The first of these collaborations was a sublime conversation between the ethereal sounds of Hrvoslava Brkušić and the geometric vectors of Douglas Nunn in Zagreb. This was closely followed by a completely spontaneous shared set by laserists Rasinger and Henke which illuminated the architecture of the Technical Museum hall with such power that I felt I could still see afterimages in the room the following day. Of note was the contrast between Henke’s usual precision-high-tech approach, which he discussed just that afternoon as originating from the need to be taken seriously within the world of large-scale audiovisual installation and performance, and the relaxed, ‘dirty techno’ improvisational style he easily returned to for his duo with Rasinger in the evening of the same day. Later on, in the more intimate settings of Osmo/za in Ljubljana, we focused on what we had been calling ‘workgroups’ throughout the festival. 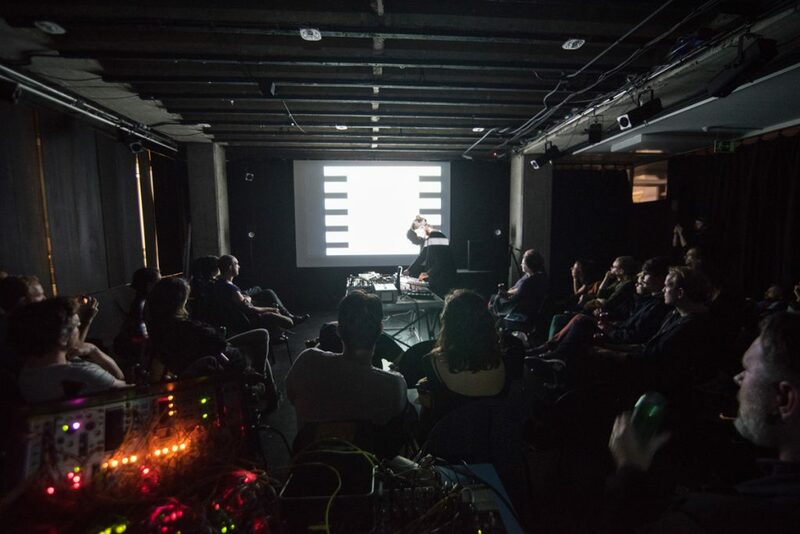 These workgroups were envisioned as a way of inviting young, local artists to interface with vector and video synthesis techniques for the first time and explore them towards the goal of an informal performance at the end of the festival. We took the extra step of inviting only women to these groups as a way of counterbalancing what I saw as a serious deficiency in female performers in our festival lineup, and of nurturing them into the larger scene of audiovisual vector artists from which we drew our international participants. 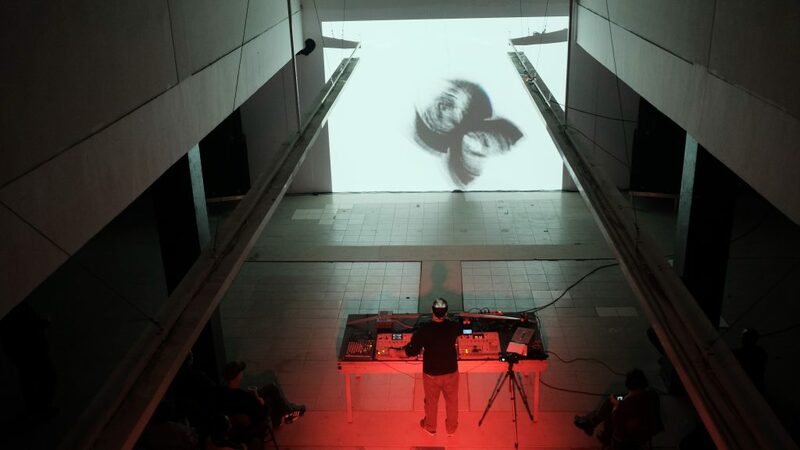 Croatians Brkušić, who shared the stage with Nunn in Zagreb, and Vanda Kreutz, who presented an inspired solo improvisation arising from her meeting with the LZX Vidiot synthesizer, were joined in the workgroups by members of the Slovene noise collective Kikimore, which was founded in 2016 in Ljubljana out of an initiative focusing on the activities of women in the area of science, technology, and media art. 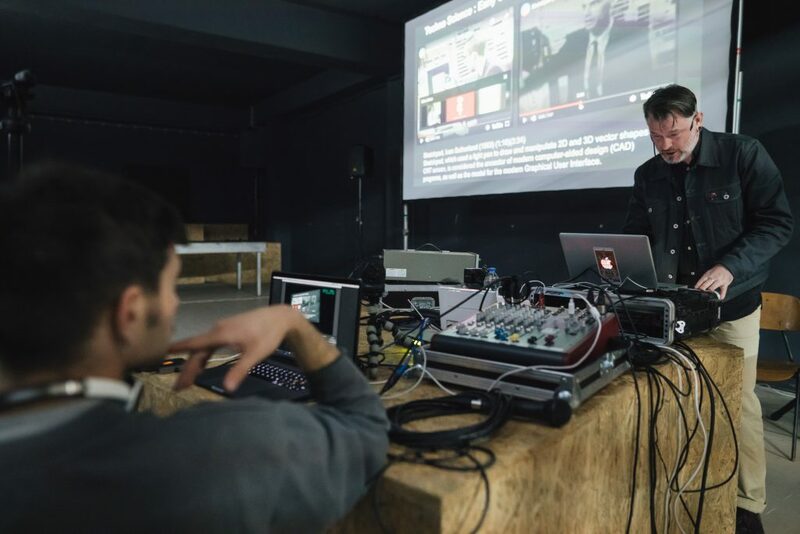 I had given them a basic demo of the Vector Synthesis patches during a residency in Ljubljana in July 2017, and their enthusiastic response guarenteed that I would remember them when we began considering who we might invite. From their collective, Staša Guček took a masterclass in the art of audio-reactive video mixer feedback from Bers, and the trio of Sara Mlakar, Nina Orlić, and Barbara Poček ran the chaotic, noisy signals from their lovingly-handmade electronic sound devices into the laser system of Rasinger, laughing the entire time. Moments such as these workgroup performances went a long way towards fulfilling the community-building goal Klif and I set out during our first conversations, as well as towards that of bringing new artists into this community with an enthusiastic welcome and a wealth of new inspiration. After reading a draft of this post, Jonas Bers pointed out to me how all the participants very quickly got involved in the aspects of community building ‘behind the scenes’ so to speak, by debugging each others’ code; adding features to their own systems by request; loaning, teaching, troubleshooting, repairing, and modifying hardware; donating printed circuit boards; coordinating workshops; creating content for one another; and actively maintaining contact after the event ended. Once the video documentation of the talks and performances are online, we hope that the discussion they stimulate will grow even larger and more inclusive of radically different approaches to the medium. Our next ambition is to organize a followup to this event, perhaps in 2020, which I would like to see go further in directions we only touched on in this edition, i.e. more female participants, more participants from outside Europe, more participatory and entry-level workshop situations for local and visiting artists, a deeper look into different approaches to the laser display from both the established professional and experimental artistic sides, a focus on the currently burgeoning field of digital plotters and mechanical drawing devices, and a new round of media archaeological excavations into the hidden histories of vector technologies and the arts created by them. We are very excited to publish the VectorHack Festival 2018 lineup today. 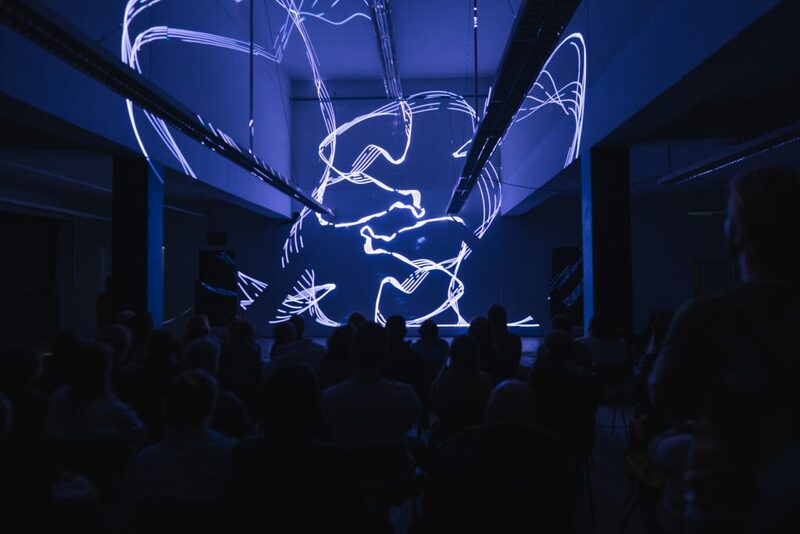 I really feel like we have invited some of the most brilliant minds in the field of experimental, audiovisual vector graphics to Zagreb and Ljubljana for one week (01-07 OCT 2018) of hacking, presentations, keynote talks, workshops, and live performances. In Zagreb, I will demonstrate my Vector Synthesis library for Pure Data on 02.10.18 and give the keynote lecture “A Media Archaeology of Vector Graphics” on 03.10.18, while in Ljubljana I will perform the Vector Synthesis set live on 05.10.18. I do hope some of you will join us, all talks, keynotes, and performances are free to enter. I am pleased to announce that I’ve been invited to present Vector Synthesis on 29 August at the Pori Art Museum, Pori FI in the context of the exhibition Steina & Woody Vasulka: Art of Memory, Works from 1969 to 2000. I will be giving a guided tour of the exhibition and performing with my Rutt-Etra/Vasulka inspired scan processing system. And this week, I will perform at a live cinema event focused on the work of ASTEPBACK (Andrea Saggiomo and Gaëlle Cavalieri) and Marek Pluciennik at the Myymälä2 gallery, Helsinki FI. I would be so very pleased to see some of you at either event. 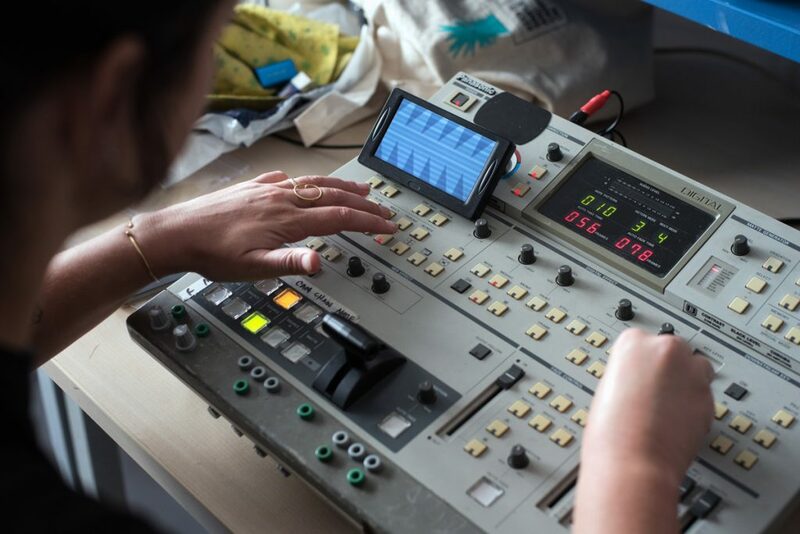 Between 26 May and 03 June 2018, I undertook an intensive residency at the Radio Belgrade Electronic Studio with the goal of using their legendary EMS Synthi 100 analog synthesizer with my Vector Synthesis software to create a new set of audiovisual experiments. Here, I present the videos in a reversed order. Liquid Iron Lattice is the fourth and final composition created during my residency at the Radio Belgrade Electronic Studio, using their amazing EMS Synthi 100. The video integrates both the Vector Synthesis Pure Data code and the analog waveforms and processing of the Synthi 100 to maximum advantage — a true hybrid digital/analog synthesis. 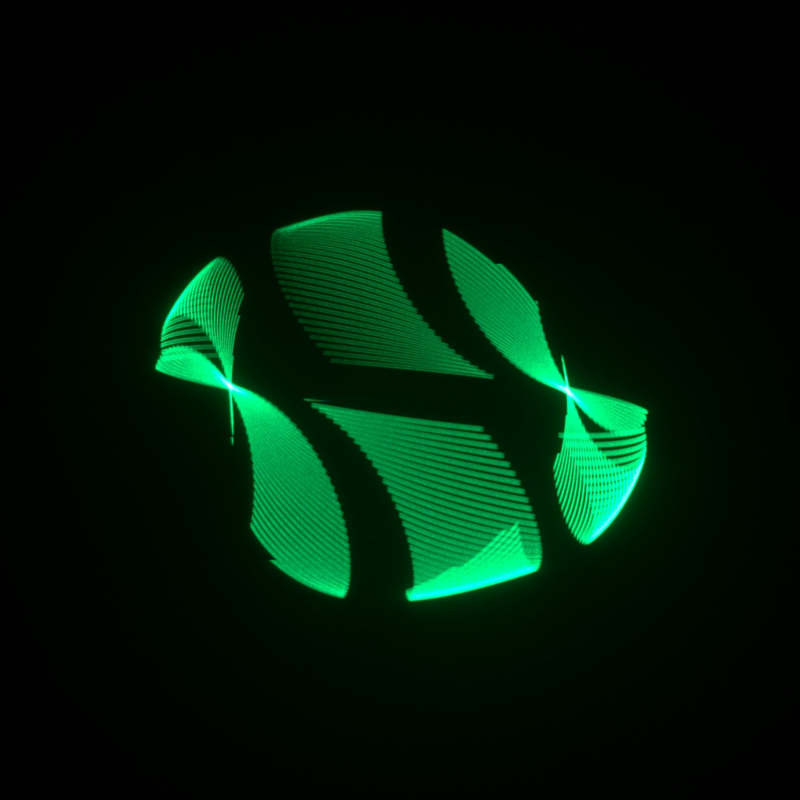 For this work, I created a simple 2D grid raster rotating in 3D space. I then applied to this grid a scan processed photograph of a simple architectural detail in the building where I am staying. The brightness values in this image push the 2D grid upwards, with a number of sine wave signals from the Synthi 100 responsible for the fluid motions of the grid. 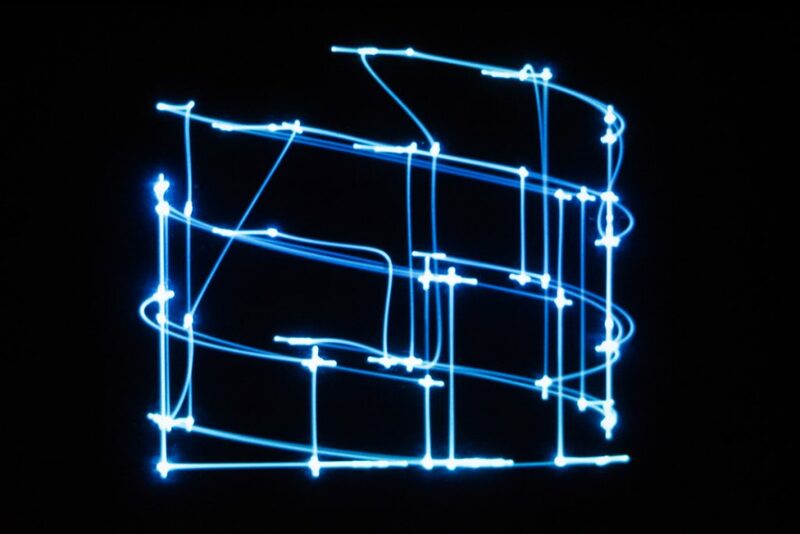 These signals were then displayed as vectors by my modified Vectrex monitor. They were also sent back into the filters and spring reverbs of the Synthi 100 for modification, and were then summed with the signals sent to the Vectrex, resulting in a variety of generative feedback effects. 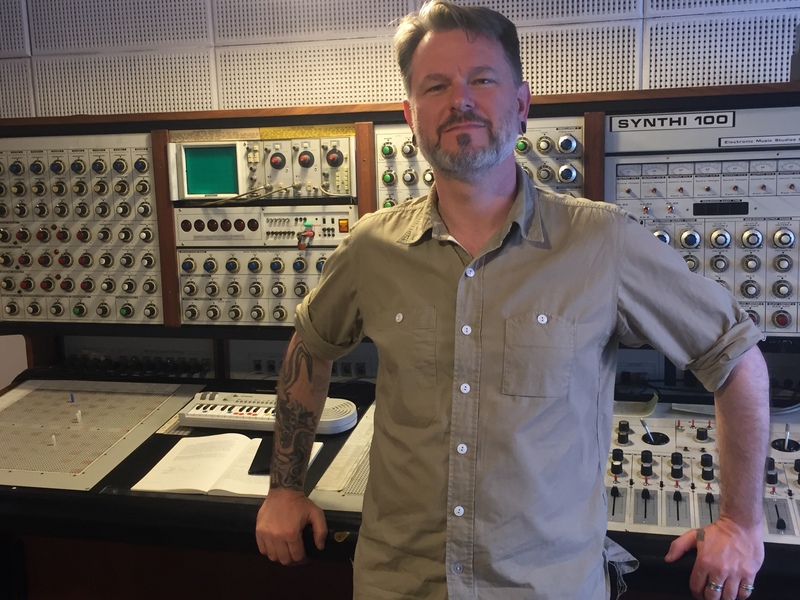 Spomenik Surface Treatment is the third patch of my week long residency on the EMS Synthi 100 located at Radio Belgrade Electronic Studio. 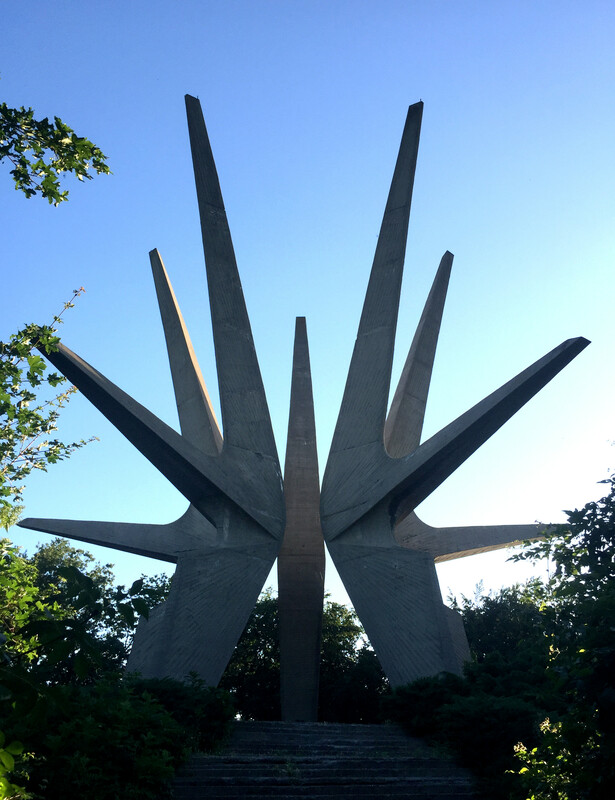 After an exciting visit to the Kosmaj Spomenik south of Belgrade, I decided to create a Modernist monument of my own from sound and light. 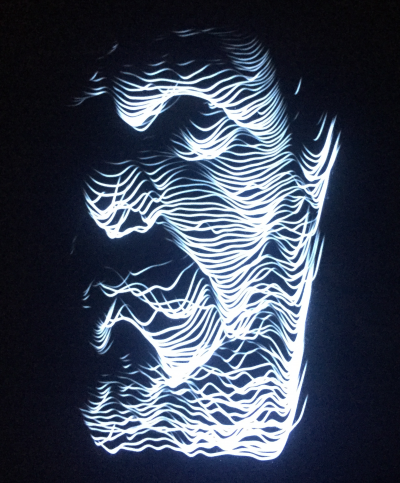 I have used my Vector Synthesis library for Pure Data to make Rutt-Etra style scan processing of a photograph of the Kosmaj sculpture, which is then displayed on a hacked Vectrex monitor using audio signals. The luminosity of a 3×3 pixel wide scanning area controls the brightness and displacement of the oscilloscope beam, with rotation and perspective added to the figure. 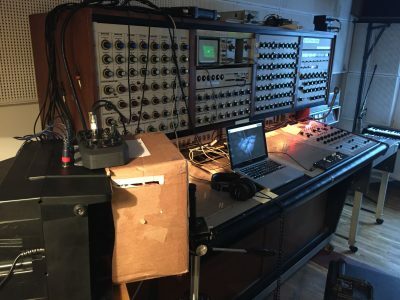 The audio signal has been further processed after creating the image through the resonant low and high pass filters and the spring reverb of the Synthi 100. Cubic Rotational Drone is the second patch of my week long residency on the EMS Synthi 100 located at Radio Belgrade Electronic Studio. The cube is created by reading the data tables for the three axes (X, Y, Z) in my Vector Synthesis library for Pure Data with a ramp oscillator of the Synthi 100. Other Synthi 100 ramps are used to modulate the size of the cube and the rotations, all set at various near-harmonic relationships to the main oscillator. 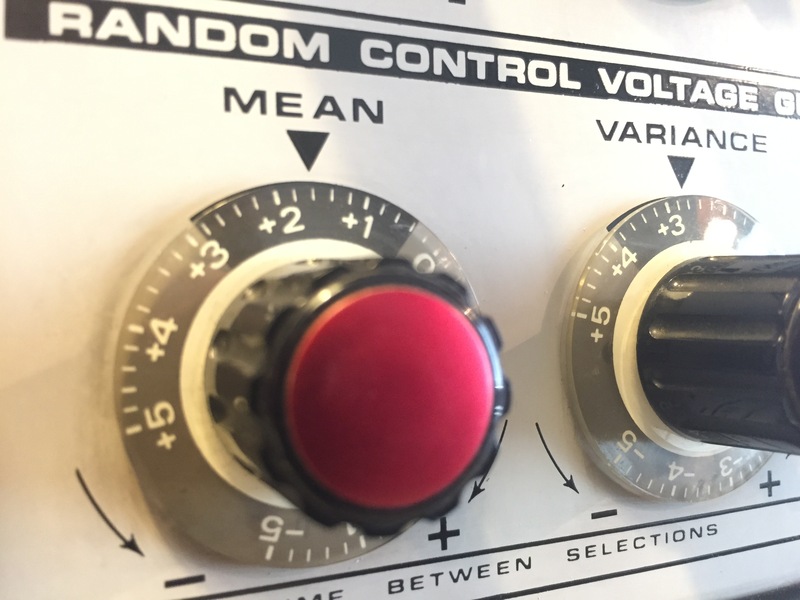 The Random Voltage Generator of the Synthi 100 makes small variations in the frequencies of those ramps. The lines are a bit rough due to the irregularities in the analog waveforms. Two signals (X and Y) are then sent to be displayed on the Synthi 100 oscilloscope, a Tektronix 5000 series modular rack. 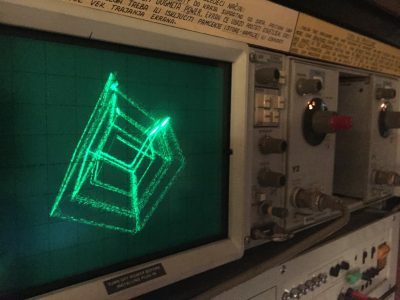 Rendering “Cubic Rotational Drone” on the Tektronix oscilloscope. 28 May 2018. Mean Variance Brushstrokes is the first patch of my week long residency on the EMS Synthi 100 located at Radio Belgrade Electronic Studio. The video raster is created by the ramp oscillators of the Synthi 100, whose frequencies are controlled by the instrument’s Random Voltage Generator. The signals are also run through the two spring reverbs, which are added to the raster signal and give the curved deformations seen here. This video employs my Vector Synthesis library for Pure Data to make Rutt-Etra style scan processing of a video image, which is then displayed on an XY display using audio signals. The luminosity of the pixels being scanned controls the brightness and displacement of the oscilloscope beam. Additional modulations of the beam by audio signals create the other visual effects seen here. The display monitor is a hacked Vectrex game console, and a version of the same audio signal sent to the monitor can heard in the audio track. Meeting Synthi 100 on the first day at the Radio Belgrade Electronic Studio. 26 May 2018. This is a series of audiovisual X/Y oscilloscope patches for the EMS Synthi 100 at the Radio Belgrade Electronic Music Studio, visualized on the Tektronix 5000 series modular rack oscilloscope. They were programmed to run autonomously without any human control. Most of them use two or three oscillators tuned to a close harmonic, and small changes in the frequencies (including temperature drift!) will make large changes in the image/sound. A couple use the Synthi 100’s low pass filters as well. 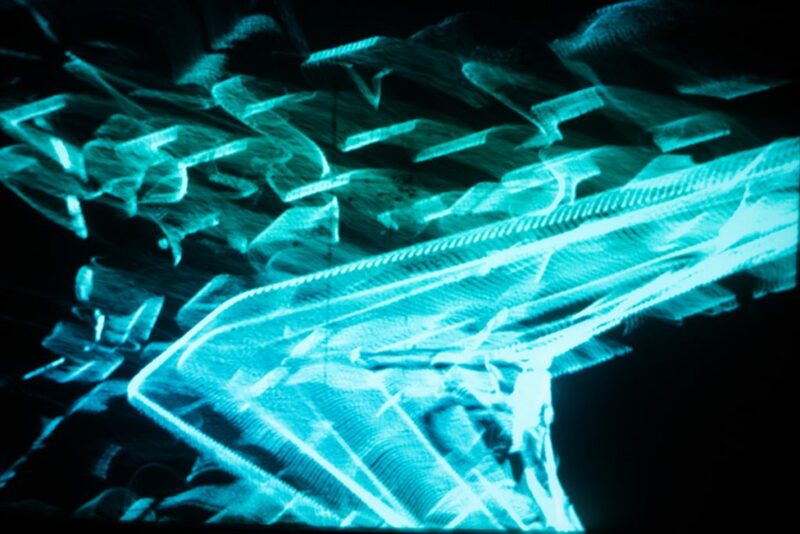 All are based on Ron Pellegrino’s laser designs from “The Electronic Arts of Sound and Light” (1983). My endless gratitude is extended to Svetlana Maras for pulling this whole thing together, and to Igor Stangliczky for his boundless hospitality. During this two-day workshop, you will explore the direct relationship between sound and image. Using the Pure Data programming environment, you can directly control the vertical and horizontal movements, as well as the brightness, of a beam of light. You will then investigate Lissajous figures, 3D models, Rutt-Etra video scan processing, and other audio-driven visual shapes and forms which can be displayed and manipulated in real time on an XY oscilloscope, or with oscilloscope emulating software directly on your laptop. The participation fee for this workshop is EUR 50, with a 10% discount for Kuusi Palaa members. The workshop runs from 11:00 to 17:00 each day. 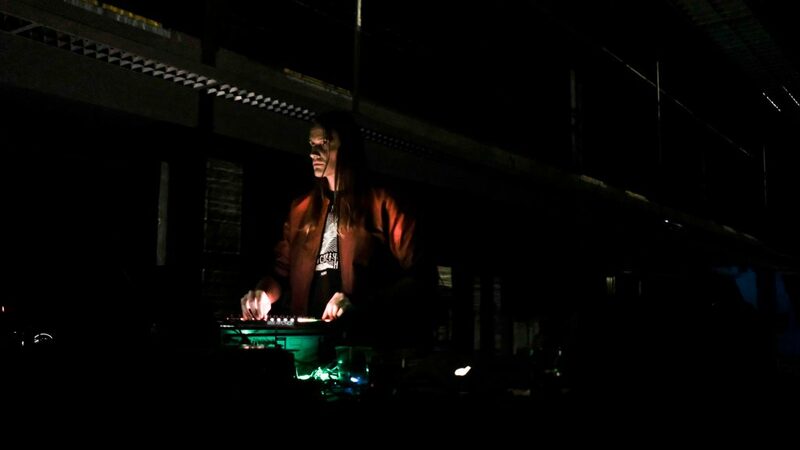 Alessandro Cortini, Derek Holzer, Macular, Antoine Schmitt & Franck Vigroux, Philip Vermeulen, Kia Mann, NSDOS, Lanark Artefax, Tobias., Patrick Russell,… are among the guest stars. I was recently asked some questions by Alparslan Teke of the Middle East Technical University in Ankara, Turkey about my instrument building practice, and I thought I might share the answers here. 1. 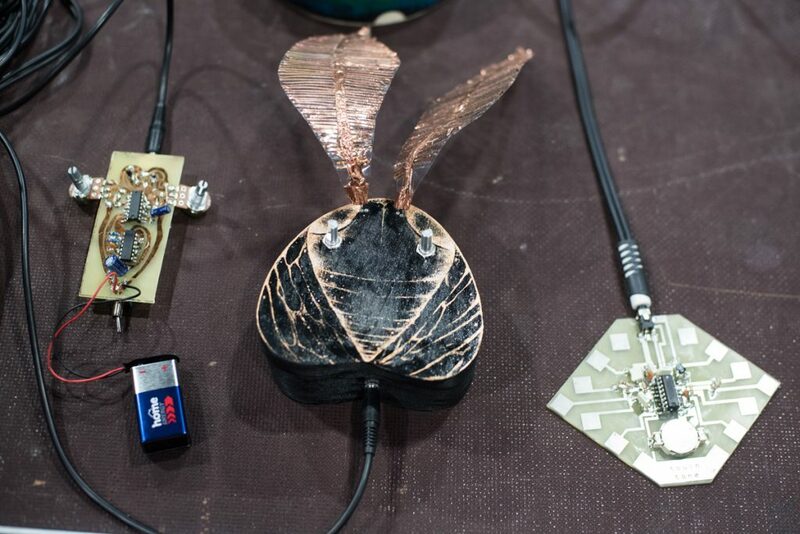 How did you start making or altering electronic musical devices? To make a long story incredibly short: I have always been interested in sound. However I lacked the discipline as a teenager to learn how to move my fingers quickly up and down the neck of a guitar or the keyboard of a piano. In my confusion, I considered “making sound” to be the same as “making music”. When I later figured out that most sound around us is in fact un-pitched, un-tempo-ed and therefore non-musical, my world opened up. But I discovered that most devices for making electronic sound still assumed one wanted to make “music” with them, so I started to take them apart to remove the “musical” part of the interface, or simply create my own from scratch, first in the Pure Data programming language and later with analog electronics. 2. In which relevant fields were you educated? None. I studied literature in my bachelor’s studies, and silversmithing before that. Perhaps that accounts for my obsession with objects with tiny parts? Other than that I am not only entirely self-educated, but also in all my school years I nearly failed every math class which was ever forced on me. The fact that I am internationally recognized as a builder of electronics and a programmer of computers remains a gigantic mystery to me. 3. What were your motivations and/or purposes when you started, and (how) did they transform? My instrument-building reflects an economic reality one faces as a non-academic, non-institutional artist these days. There is so much digital sound out there right now, and no one pays you for making any of it. But since we are working in the era of the “pro-sumer”, there are plenty of people who are constantly spending money on the tools to make their own sound. So what started as a way of taking control of my own tools and wrestling them away from the traditional music world ends up being an economic relationship with the music world all over again once they start to take interest in my way of working. 4. Do you consider this artistry (of making electronic/electroacoustic musical instruments) as your profession? If not, do you have any else? I have no plan B at the moment. This is my day, night, weekday, weekend, summer, and winter job. 5. What words or concepts would you use to describe things you’ve created? Non-linear, chaotic, generative, intuitive, iterative, multi-modal, phenomenological. Currently a third of my time in this field is spent making instruments for sale. Another third is spent preparing for, traveling to and playing gigs. The last third is spent teaching. 7. Where and how do you get your ideas that end up with different devices? Up to quite recently, almost everything in the analog synthesizer world was some kind of riff on something which was made in the 1960’s and 70’s already. This happens due to an unprecedented access to information about those devices which was much more mystical and unreachable at the time they were made. Despite the efforts of their inventors to share the knowledge at the time in many cases, the widest propagation effect was delayed until internet access became largely ubiquitous. I still think some of the best work in the field was done back then, and I spend a lot of time looking at old designs of audio and video devices from many eras, as well as related readings on the cultural, aesthetic, and philosophical ideas of the time which gave birth to these machines. Some of my favorite eras are the 1930’s (optical synthesis technology), the 1950’s (early analog and digital computer vector graphics), the late 1960’s (patchable, cybernetic analog computers become Buchla synthesizers), and the early 1970’s (after the Sony Portapak, television comes unglued through the work of Dan Sandin, Steve Rutt, Bill Etra, Steina and Woody Vasulka, Nam June Paik and others). However, the latest developments of hybrid digital/analog synthesizers have given me great hope and faith that finally we can also move on from these older models, and stop imitating drum machines from the early 80’s for the next 40 years. 8. Where and how do you get your raw material or components? Small local shops when I’m in a hurry, larger European suppliers when I’m not. I haven’t moved to ordering from China in bulk yet. Most of my wooden instrument enclosures come from flea markets, antiques shops, strange collectors I have met over the years, and EBay. 9. How much time of a day or week (or a month, a year) do you spend on the workbench? Do you have a working schedule? Sometimes I sleep. Then I feel guilty. I don’t know how to take vacations since beaches bore me to death, so I always end up finding some way to make a project out of a trip. 10. What time of this is actually building something, and in which other ways you spend time there? Would you confine your occupation of creating new musical devices to only the activities you do on the workbench? As I said, I am pretty much always working. If I am not building, performing, or teaching, you can usually find me in “my office” (currently a rather relaxed cafe-bar in the Kallio district of Helsinki) doing research. 11. Do you have a separate workshop to maintain your effort, or is it embedded in the place you live in? I had a working space in my Berlin flat for several years. It was the most unhealthy thing I ever did to myself, and my quality of life improved dramatically when I started renting out a studio. In Helsinki, I share a small space with a couple other artists who are pretty much never there, but I do dream about getting a larger space for myself again once finances allow it. 12. Do you produce in large quantities? Do you use the devices you`ve made, or do you sell them? Does this occupation provide you a livelihood? I make everything in very small batches. This is because I am too stubborn to get into modern, automated processes and compulsively do things in very difficult ways, by hand. 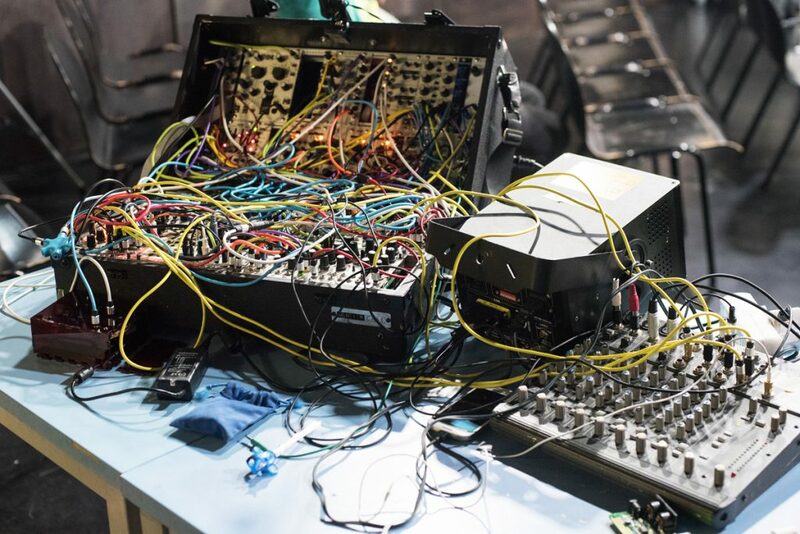 There is such a giant market for Euro-rack synthesizers made in far more efficient ways, I feel like if I get involved in that it will be a race to the bottom in terms of cost and quality. Probably I’m just a huge control freak. I stand by everything I have built, and I use my own instruments every time I perform. In fact, I can’t really stand using things other people have built unless it’s something that would be really redundant to make myself, like a 16 channel audio mixer. I have been lucky enough to be able to live from my art for the better part of two decades now, but that has also meant that I must constantly re-evaluate what “my art” means. This is how commercial instrument building and teaching became folded into my work. As I said, there is no plan B. It’s too late in life for me to get a start in the banking industry. Workshop participants. I have offered my workshops in artist-run spaces, in music and media arts festivals, and in bachelors and masters level university programs in a variety of areas, including but not limited to architecture, theater, visual arts, media studies, audiovisual design, and music conservatory studies, in countries across Europe, North and South America, and New Zealand. The participants of these workshops have come from all walks of life, from professional Scandinavian artists to Native American high schoolers who have been tragically mis-labeled as “problem students”. The oldest participant in one of my workshops has been nearly 80, and the youngest just 8. One of the most unique participants was completely visually-impaired, yet insisted he would solder together his own electronic instrument. With a bit of assistance, he did just fine. 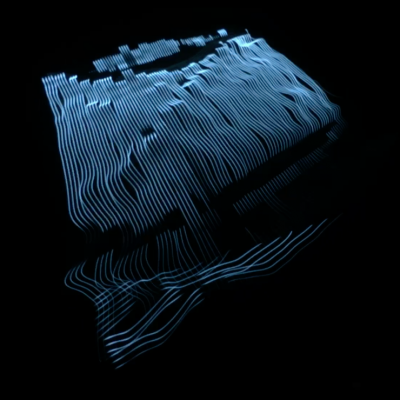 VECTOR SYNTHESIS is an audiovisual, computational art project using sound synthesis and vector graphics display techniques to investigate the direct relationship between sound+image. It draws on the historical work of artists such as Mary Ellen Bute, John Whitney, Nam June Paik, Ben Laposky, and Steina & Woody Vasulka among many others, as well as on ideas of media archaeology and the creative re-use of obsolete technologies. 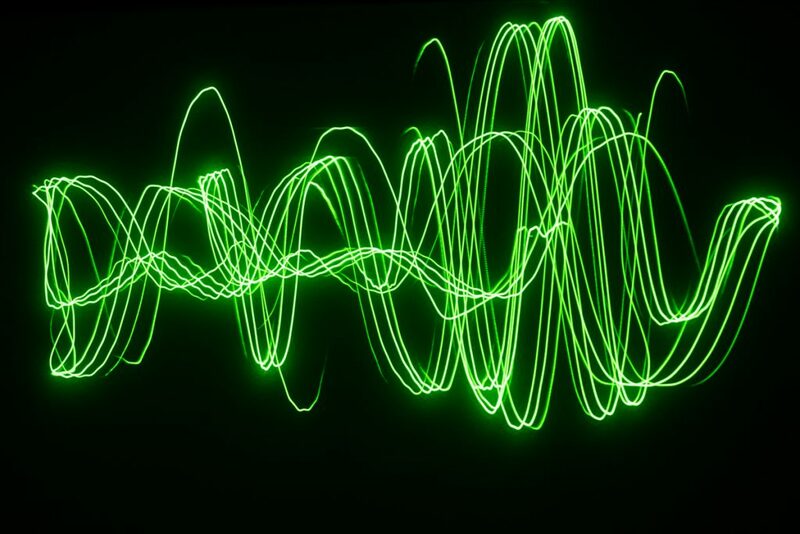 Audio waveforms control the vertical and horizontal movements as well as the brightness of a single beam of light, tracing shapes, points and curves with a direct relationship between sound and image. The Vector Synthesis library allows the creation and manipulation of 2D and 3D vector shapes, Lissajous figures, and scan processed image and video inputs using audio signals sent directly to oscilloscopes, hacked CRT monitors, Vectrex game consoles, ILDA laser displays, or oscilloscope emulation softwares using the Pure Data programming environment. During this workshop, you will learn how to use a custom library in the Pure Data programming environment to directly control the vertical and horizontal movements, as well as the brightness, of a beam of light. 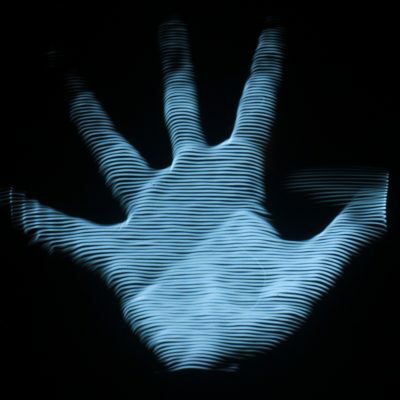 You will then explore Lissajous figures, waveform representations, and other multiplexed, audio-driven visual shapes and forms which can be displayed and manipulated in real time on an XY oscilloscope, Vectrex game console, ILDA laser display, and other analog vector displays, or with oscilloscope emulating software directly on your laptop. Powered by WordPress v 5.0.2. Page in 2.702 seconds.